WATERBURY, Conn. (July 10, 2011)—Roger Subramani stands in the tunnel at the University of Pennsylvania’s Franklin Field, gazing out at a near-empty stadium and the greenest astro turf he has ever seen. The events that have led him to this point are the stuff movies are made of, and this movie feels like a cross between “Any Given Sunday” and the “Little Giants”. Subramani stands 5-foot-4, a cheeseburger or two away from 110 pounds. He was too small to play on his high school football team. He never even tried out. Yet somehow here he is, now bouncing up and down with his teammates in the tunnel of the oldest and one of the most historic stadiums in the country. They are awaiting the signal from an oversized assistant coach to charge onto the field in preparation for a real, live college football game, the first one in Post University history. Subramani is suited up in one of the fresh new hunter green uniforms his school had purchased just three months ago. Just for clarification, he’s about to charge onto Ben Franklin Field, as in that Ben Franklin guy who invented electricity and signed the Declaration of Independence. The field happens to be located inside the same famous stadium that hosts the Penn Relays, arguably the biggest annual track and field event in America. It was home to the nation’s first scoreboard, the first-ever radio broadcast of a football game, and for years, the Philadelphia Eagles, who incidentally, happen to be Subramani’s favorite NFL team. So how can a kid five-foot nothing, a hundred and nothing, possibly be in this position without Charles Dutton standing nearby? Well, Subramani and his Post teammates are about to take part in a tradition that goes back 77 years; a tradition that former president Jimmy Carter and former Secretary of Defense Donald Rumsfeld once took part in. It’s called sprint football, and it is perhaps the greatest loophole in American sports. Sprint football is real football, only without the 300-pound linemen who put buffets out of business. There’s a strict weight limit of 172 pounds, but everything else is the same. The field is still 100 yards long; there are still four downs, and the coaches still scream maniacally from the sidelines. There are still violent collisions, acrobatic wide receivers and punishing linemen. It’s college football…only without the hulking linebackers, the crowds, bands, cheerleaders, and television contracts. The major difference is that, because of the weight limit, everyone on the field is virtually the same size. Defensive linemen can outrun wide receivers. Running backs may be bulkier than the offensive linemen blocking for them. And no one’s going to mess with a kicker who can bench-press more than a defensive end. The sport, which was known as lightweight football until 1998, has been around since 1934, when a group of Eastern universities banded together to form what would become known as the “Eastern 150-pound Football League.” The league included Columbia, Rutgers, Lafayette, Yale, and Villanova, all of which have since dropped sprint football, in most cases for financial reasons. It also contained members Cornell, Princeton, Army, and Navy, which still compete in today’s Collegiate Sprint Football League (CSFL), the only league of its kind in America. The Eastern 150-pound League took a brief hiatus from play during World War II, canceling the 1943 through 1945 seasons, but the sport returned stronger than ever in 1947. Leagues began forming across the country, including in what is now known as the Big Ten, where Michigan, Ohio State, Illinois, and Wisconsin all fielded teams. Legendary Washington Redskins coach and National Football League Hall of Famer George Allen got his start as an assistant at Michigan, which won league championships in 1947 and 1948 before the league folded the following year. Today, the CSFL consists of seven schools: Army, Navy, Cornell, Princeton, Pennsylvania, Mansfield University (Pa.), and Post, with the latter two teams both being added to the league in the past two years. Perhaps the most romantic thing about sprint football is that just about any average Joe from Whocares High has a chance to find himself immersed in a scene like Subramani’s; ready to shine under the Friday night lights that illuminate an Ivy League football cathedral. Subramani comes from Kaynor Tech in Waterbury, Conn. He enrolled at Post University in Waterbury in 2009 to pursue a degree in computer science. Never in a million years had he pictured himself suiting up for the football team, primarily because Post University didn’t have a football team when he first came to campus. The school, which is a private institution of about 1,350 students, announced its plans to adopt the sprint version of the sport in November 2009, three months into Subramani’s freshman year. Post University joined the CSFL the following year. “I was so excited when I heard about it,” said sophomore running back Derrick Chance, who would score the first touchdown in school history in Post’s 41-14 loss to Pennsylvania at Franklin Field. “Not too many people get a chance like this, to be playing college football. It’s just awesome,” he said. Many of the players on Post’s 65-man roster didn’t even play football in high school, but some had given up on dreams of gridiron glory after short stints at other colleges. Junior running back Lee Knight spent a year at NCAA Division III Becker College in Massachusetts before quitting the team and transferring to Post, believing he had buckled on his chinstrap for the final time. He was overcome with joy when he heard the news late in his sophomore year that his new school was going to be offering sprint football. The surprise isn’t just limited to players at a first-year program like Post, however. Longtime Cornell head coach Terry Cullen says most of his players had never heard of sprint football before they set foot on campus. “We have about 20 to 24 freshmen [every year] who don’t know about it, and they come out for the team,” he said. “We have 6 to 10 seniors who come out every year who don’t know about it.” Imagine playing a sport that is so invisible on campus that your own classmates go three full years without knowing you exist. Cullen says that there are “50 to 60 kids” who contact him as high school seniors, inquiring about the sport. “Most of them see it on our team website, or the league website,” he said. Still, Cullen estimates that only about one-third of his incoming players each year have heard about the sport before enrolling at Cornell. Despite sprint football’s relative anonymity, recruiting has not proven to be too great a challenge for the league’s coaches. 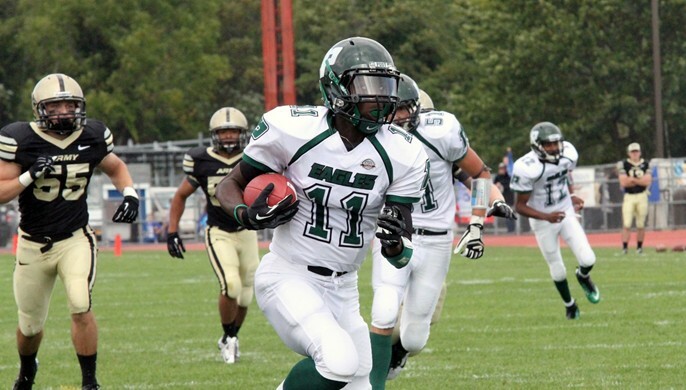 High school coaches agree that collegiate sprint football offers a high level of competition. Despite the fact that most coaches are primarily concerned with matriculating their star players into heavyweight college football, the ones that have heard of sprint football recognize the unique opportunity it offers their less physically gifted players. Incredibly, many high school coaches were surprised to learn that the sport exists when interviewed for this piece. Three separate Connecticut high school coaches, who declined to be quoted in this story, admitted they had never heard of the sport. “I think the reason why many coaches don’t know it’s out there is because there aren’t many schools that offer it, so there aren’t many opportunities for kids,” said Post head coach Pete Ewald. “I think there will be more exposure for it in the next few years because of the fact that we joined the league, and Mansfield just came in a year ago. I think it’ll get more exposure regionally,” he said. Despite its perceived high level of competition, sprint football doesn’t exactly draw huge crowds the way “fat boy” er—ahem, non-weight restricted football does. There’s no Friday night fever at Cornell, as about 55 fans showed up for the Big Red’s October matchup with Post last season. A few more lined the stands at Princeton’s Powers Field later that month to watch Post defeat the Tigers, 33-18, for the first win in school history. (Princeton, remarkably, has not won a game since 1999, a streak of 74 losses in a row.) Post saw over 1,000 fans attend the school’s first-ever home game at Municipal Stadium in Waterbury on October 30, 2010, but attendance is expected to dip once the team is no longer seen as a novelty. Despite general apathy from heavyweight coaches, students and fans, there is one annual showcase which attracts big-time attention from true sprint football fans. The Allegiance Bowl, or the annual showcase between Army and Navy, has filled stadiums at various neutral sites for nearly 30 years. Over 3,800 fans showed up to Rip Miller Field in Annapolis, Md., to watch Army defeat Navy, 32-30 in 2010. The 2011 game will be played in Saratoga, N.Y., which is about two hours from Army’s West Point, N.Y. headquarters. In 1994, Sports Illustrated’s Brad Herzog wrote an article chronicling sprint football’s popularity in Pottsville, Pa., where two teams (one of which usually being Army), participated in an event known as the “Anthracite Bowl” on an annual basis from 1983 until 2001. The event became an opportunity for Pottsville residents to open up their homes to the athletes, hosting them for the weekend. Then-Army linebacker James Lewis was quoted in the article as saying that players would usually stay with the same hosts two or three years in a row, and then stay in contact with them through letters or visits. “For most of the guys on the team, it’s like a second family,” Lewis said. 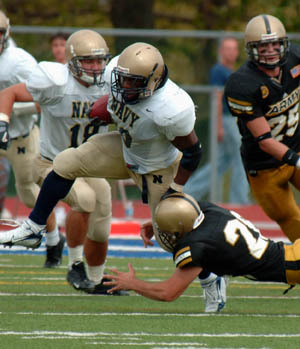 There’s no question that sprint football is a tradition at the academies, where former president Jimmy Carter once played during his time as a Navy midshipman. With the festivities that surround Anthracite Bowl, the Allegiance Bowl, and a trophy case that would make the New York Yankees blush, it’s no wonder that the service academies are seen as the standard in sprint football. It may be even easier to see what makes the sport successful after 77 years of competition. Sure, it helps that the game is played at prestigious institutions which can afford to finance Friday night football games between student-athletes who can’t quite play with the big boys. 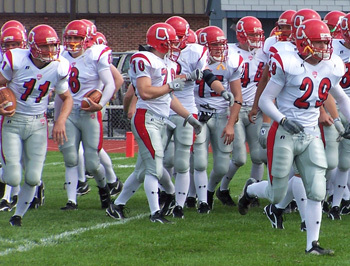 (Cornell sprint football is financed 100-percent by alumni.) And sure, it doesn’t hurt that schools like Post will receive tuition money from athletes who otherwise would have never stepped foot on campus. Still, the thing that makes sprint football successful to this day is the same thing that made it successful back in 1934. The chance to stand in the tunnel and stare at the greenest grass—or Astro Turf, you’ve ever seen. It’s the kind of thing dreams—however small, are made of. William “Kels” Dayton is one of the up-and-coming writers in America. Check out his website, www.roundballdaily.com for more exclusive content.